With Booster Flex it's easy to make 18V from a single 9V outlet. It's equipped with a step-up converter in the mould placed in the middle of the cable. 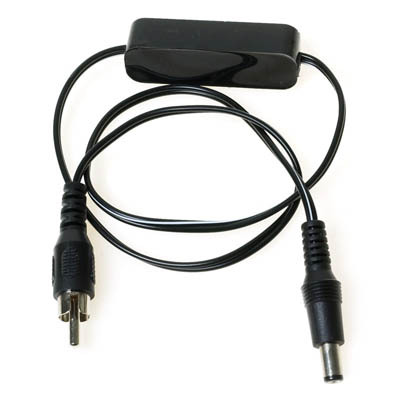 When you connect the Booster Flex to a 9V outlet, you'll obtain 18V on the other end, which is a type 1 plug - a black 5.5/2.1mm centre negative DC-plug. The most common application is for 18V Wah pedals or the bigger MXR pedals needing 18V. Remember that the maximum current the Booster Flex can deliver is 50mA. BE CAREFUL when using Booster Flex. There is a risk of damaging one of your 9V pedals by powering it with too high a voltage. Check the specifications of the pedal and if you still have some questions, you're welcome to send an e-mail to support@cioks.com and get some useful information. Dit artikel is aan ons assortiment toegevoegd op woensdag 01 september, 2010.